MSPs manage the network – an area of growing risk, regulation, and legal action. Many do not realize their responsibilities have surged from a boom in data privacy law and cyber attacks. Watch this session to see how to avoid legal traps that surround your MSP business. Topics include cyber security incident legal exposure, procting your MSP from new clients, hidden risk of cyber insurance, and liability traps in HIPAA and PCI DSS. Hackers and malware love healthcare. The industry is loaded with legacy systems, spotty security, and deep pockets. What threats are the most dangerous? Which cause the greatest number of data breaches? What should you focus on to protect clients? Find out in this webinar recording. If you’re not careful, network security can waste your time and kill your profits. In this webinar, we listed 5 major time wasters for your company: failure to prep, technical traps, ignored threats, working on-site, and forgetting stuff. Hackers have found new tricks for their emails, and the number of phishing attacks has exploded. See how the attacks have changed, the new tactics they use, and how to convince your clients to take action. The ransomware plague has entered the healthcare industry with severe consequences. See how this threat affects HIPAA compliance, including whether an infection qualifies as a “security incident” or “data breach”. See the biggest security threats for small businesses in 2016. You’ll see how to harness the power of these threats to drive growth in your IT business and how to protect clients. 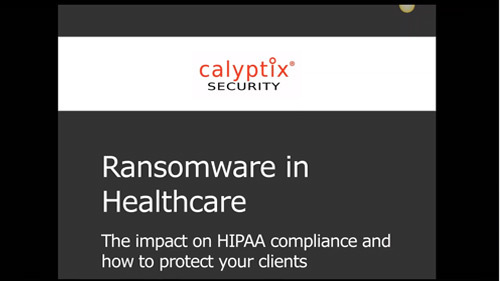 Amy Babinchak, a Calyptix partner and owner of Third Tier and Harbor Computer Services, joined us for our second webinar on ransomware. In this recording, you’ll get more technical information on how to stop this threat from harming your clients. If you’re unsure about healthcare IT, then you’re not alone. Many IT providers are reluctant to enter the market. View this presentation on breaking into healthcare IT to see how some of our top resellers got started in healthcare and the sales strategies they use to land new clients.